Aluminum provides light weight and durability. 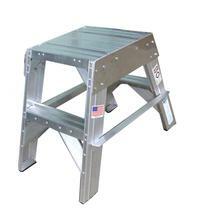 Heavy duty 16" x 16" skid resistant platform. All gussets are 3/16" on front and back of all steps. Platform side plates are .125" to provide additional stability. Handrail options available upon request.